Rumford, ME: The Mt. Blue Men and Womens Nordic Ski Teams made it a clean sweep at the 2017 Jonathan Sassi Memorial 5K Classical Race at Black Mountain Ski Resort on January 28th. Leading the girls team was gold medalist Julia Ramsey, who finished the course in 16:59.8. She was followed by Maranacook's Laura Parent (17:29.7) and teammate Meg Charles, who completed the course in 17:47.4. Other top ten finishers were Deering's Ewka Varney, Maine Coast's Louise Ahearne, Maranacook's Abb Despres, Gould Academy's Izzy Chase, Yarmouth's Hannah Corey, Freeport's Lily Horne, and Mt. Blue's Gretchen Huish. In team competition Mt. Blue girls finished with 25 points to take the team championship, followed by Maranacook HS with 47 points and Yarmouth HS with 78. In the men's race, Mt. Blue's Tucker Barber continued his outstanding winter by capturing the top spot by finishing the world's class course in 13:38.5. Freeport's Yacob Olins finished second with a time of 14:27.2, while John Lane of Yarmouth took the final podium spot, finishing in 14:30.6. Rounding out the top ten were Zach Holman of Marancook, Caleb Niles from Deering, Freeport's Bennett Hight, Maranacook's Mark McLaughlin, Cameron Bancroft of Oxford Hills, Nolan Rogers of Mt. Blue and Deering's Peter Jordan. In a very tight race for the team championship, the boys from Mount Blue came in 1st with 39 points, followed by Maranacook with 40, and Freeport finished 3rd with 44 points. Race photos are available at https://rivervalleygraphics.smugmug.com/Skiing/2015-Sassi-Memorial-5K. The Mt. 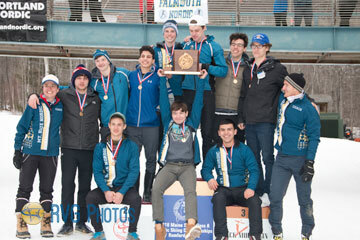 Blue boys captured the 2018 MPA Class A Nordic Championship on Black Mountain's John Roderick Trail System on February 23rd. This year's event featured a Nordic pursuit race, which was the first of its kind for the state championships. The Cougars finished with 40 points, while runners up Falmouth HS finished second with 57 points. The individual winner of the men's pursuit race was Portland High School sophomore Liam Niles. Niles started the race just one second behind the Classical Champion Roy Varney of Leavitt and passed him during the first of two laps on the 2.5k course. 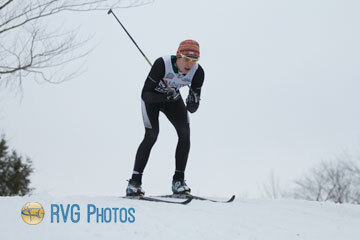 Varney finished second in the pursuit, followed by Deering High School's Peter Jordan. The Freestyle race gold medalist was Ethan Livingwood of Falmouth, who skated the course in :13:39.2. Taking the silver medal was Jordan, who crossed the finish line in :13:40.8. Winning the bronze medal was Alfie Walker of Fryeburg Academy with a tiem of :13:56.6. In the women's competition, the Fryeburg Academy ladies edged the Deering Rams, 38-39 to win the Class A Nordic Championship. The pursuit champion was Morse High School Junior Jen Wilbraham. Wilbraham was the first out of the stadium due to her gold medal finish in Day 1's Classical race. 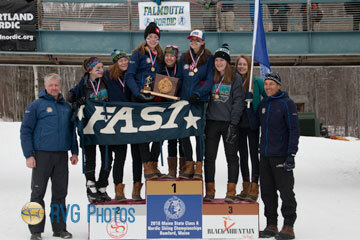 Finishing second to Wilbraham was Emily Carty of Fryeburg, while Freshman Eva Clement of Falmouth HS finished third. The gold medalist in the Freestyle race was Carty, with Clement taking the silver and Wilbraham the bronze. Leavitt High School's Roy Varney took the gold medal in the 2018 Maine Class A Men's 5k Classical race at Black Mountain on February 22. Varney completed the two-lap course in :15:53.1. Finishing in second place was Liam Niles of Portland HS, who finished in :15:54.5. Grabbing the final podium spot was Peter Jorday of Deering HS, who crossed the finish line at :16:32.6. Team scores have the Mt. Blue boys with a comfortable lead over Leavitt and Falmouth. In the women's comtetition, it was Jennifer Wilbraham of Morse taking top honors, finishing the course with a time of :18:46.4. Grace Tumavicus of Deering took the silver medal with a time of :19:15.8. Mt. Blue's Emma Charles took the bronze medal with a finish of :19:37.8. The Fryeburg girls have the lead over Deering after this first day of competition. Races continue tomorrow with the 5k Freestyle pursuit. Races start at 9:00 am with the men going out first. The MPA Class A State Alpine Championship Schedule has been adjusted due to this week's weather conditions. The times for Day 1 at Mt. Abram have been revised, and Day 2 has been moved to Black Mountain of Maine. Start times may be altered only by the Jury. All coaches will be notified as events are changed or updated. Because of the weather, Thursday's races will use a two-lap, 2.5k course using the lap loop. The exact course will be announced after inspection and trail work in the morning. Nordic Classical Awards will be presented after the girls’ races. Peter Mamrol, from Anchorage, Alaska and Dartmouth College, won the 5th Annual John Roderick 50k Marathon with a blistering time of 2:10:26.1. Mamrol took the lead early in the long distance race and never looked back. He skated with ease, and seemed as fresh at the finish line as he did at the beginning of the race, although he may argue that point. The race is recognized as part of the 2016/17 New England Marathon Series and is part of the legendary Chisholm Ski Club's 100th Anniversary Celebration Weekend. The 50k race consited of 9 laps around a 5.3K course. Also included in the day's events were 25K and 15K. 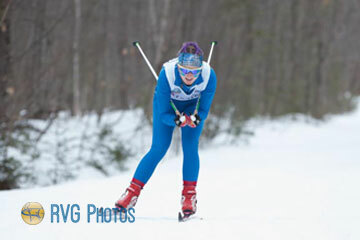 The University of Maine Farmington's 15k freestyle was also a division of the race. Finishing second to Mamrol was Cameribn Cogburn, who completed the race in 2:27:33.7. Taking the bronze with a time of 2:35:17.0 was August Posch, skiing for Team Fuzzy SCARPH. Alison Chase was the top women's finisher in the 50k with a time of 2:51:35.8. In the women's 15K UMF race, Alisha Labbe took the gold medal for UMF with a time of 57:39.0. The silver went to Bates College's Sophie Gerry, who completed the course in 1:02:06.4. Rounding out the top three was Bates' Emma Marchetti at 1:04:40.2. Despite the recent heavy rains, the Black Mountain of Maine and the Chisholm Ski Club were able to salvage both the alpine and nordic courses to provide a great day of skiing in the 2018 Chisholm Challenge. In the initial race of the day, Mia Corcoran, skiing for the Chisholm Ski Club's race team, capture the gold in the girls Giant Slalom with times of :27.03 and 27:82 for a :54.85 total. Corcoran's time was just over a second faster than runner-up Madison Papianou (:56.02). Papianou's first run of :26.80 was the fastest run of the day. Coming in third was Katie Yeaton of the Farmington Area Ski Team. Rounding out the top six were Hannah Macmillan of Rangeley, Emily Harper of Maranacook, and Anna Erb, also of Maranacook. In the boys race, Farmington's Josh Smith came in first with a total two-run time of :53.47. 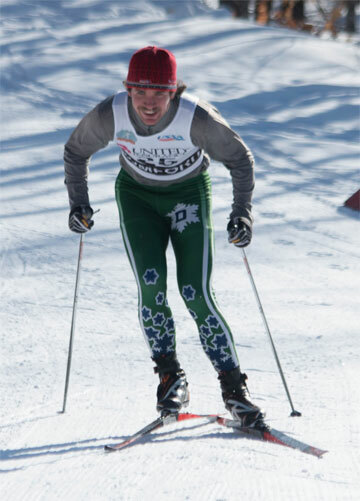 Skiing for Rangeley, Charlie Pye captured silver with times of :27.26 and :27.23. Third place went to Maranacook's Dylan McGarr (:57.32). Capturing the next three spots were Tyler Smith of Auburn, Bryce Marcoux of Chisholm Ski Club, and Trent Beaudoin of FAST. In the afternoon girls Nordic Freestyle event, it was Farmington Area Ski Team, led by gold medalist Emma Charles, dominating the field with the top 5 finishers. Charles completed the 3K race in 9:18.7 to capture top honors. Teammates, Kamryn Joyce, Bridget Reusch, Moriah Reusch, and Lucinda Carrol took the next spots with Telstar's Nyla Scott coming in sixth. Farmington Josh Smith came in first in the boys race with a time of 8:32.6. That double win was more than enough for him to be crowned skimeister champion. Telstar's Eli Shiffrin (8:38.1) took the silver, with LABK's Ellis Slover capturing the bronze (9:18.1). Taking the next 3 spots were Burke Macleay of CMSC, Benjamin Condit of Auburn, and Isaiah Doscinski of FAST. Farmington's Kamryn Jocye came in 9th in the Giant Slalom and together with her 2nd place finish in the freestlye race won the girls' skimeister award. In boys team results, FAST came in first with 39 points, with Camden (136) edging out Auburn (141) for second place. The top three girls team were identical to the boys, with Farmington finishing with 53 points, Camden with 166, and Auburn in third with 188 points. In the 3rd grade and under division, Jack Bartash finished 3 one hundreths of a second faster that Tristan Riley to take first place. Congratulations to all skiers for their great efforts.